If you point your web browser to OwensCorning.com, the home page of Owens Corning, you’ll be greeted with the company’s friendly, iconic Pink Panther logo. 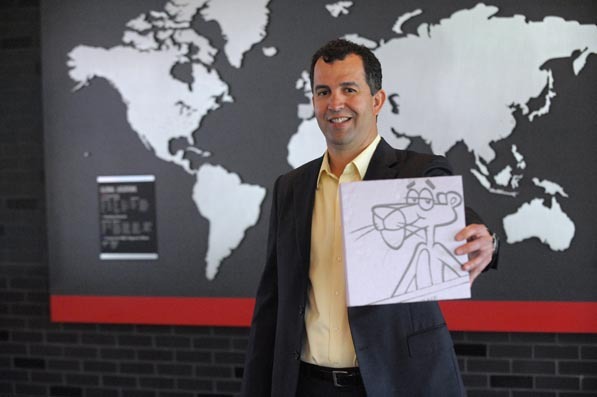 This time, he’s holding a globe in his hands, and a sliding banner image next to the panther advertises various Owens Corning services that boast they’re making the world beautiful, energy-efficient, and comfortable. It’s a global message trickling down to the ethos of all Owens Corning’s diversified business services, such as the Engineered Insulation Systems products and services, which is headed up by Joe Ochoa, vice president and general manager. In this capacity, Ochoa oversees the company’s foam insulation, air handling and mechanical systems, original equipment manufacturing (OEM), and interior systems businesses—one of the largest business units at Owens Corning—and these responsibilities touch all parts of the globe. In 2012, Owens Corning’s overall sales were $5.2 billion, $3.5 billion of which came from the building materials group. A Texas native, Joe Ochoa currently serves as vice president and general manager of Engineered Insulation Systems for Owens Corning. Ochoa has a business degree from the University of Texas and after completing his MBA at Stanford University Graduate School of Business, Ochoa worked in various sales and finance roles for Dole, Procter & Gamble, Frito-Lay, A.T. Kearney, and various Dallas-based start-ups in the mid- to late-1990s, before joining Owens Corning in 2001. When Ochoa’s involvement in the start-up began to dissolve, he signed on with Owens Corning to serve as a general manager for the company’s contractor services. Then, in 2003, Owens Corning offered Ochoa an opportunity as CFO for the company’s acquisition of Vitro Fibras, a Mexico City-based company. In business school, Ochoa had an internship for Dole in Costa Rica, which reignited his passion for the Spanish culture and language, so the opportunity to relocate to Mexico City promised an opportunity to development his language in a new, foreign-yet-familiar context.